All waffles are sold with a choice of one scoop of Ice Cream, option of additional whipped Cream and one topping. Using our signature red velvet waffle batter to create a light, fluffy dessert that is accentuated by the Oreo pieces that have been baked into each and every waffle. A Rich deep chocolate batter that has choc chips baked into each and every bite that’s sprinkled with choc chips as soon as it comes out of the machine and served with thick chocolate sauce. A moist red velvet waffle made by the professionals that has inspired by our world famous cake, unlike any tasted before and true to ourauthentic American recipe that is a wonderful delight. Rainbow sprinkled Vanilla Velvet, smooth waffle that presents a multi coloured treat that is second to none and visually beautiful. 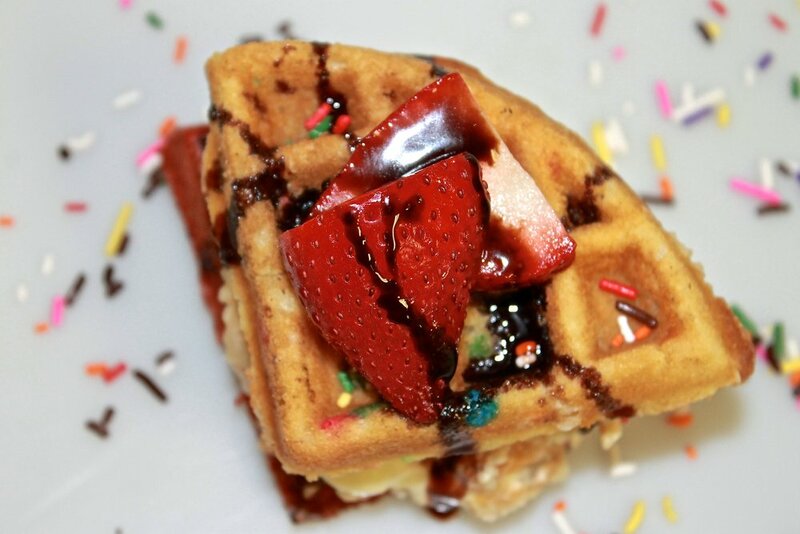 Velvet smooth vanilla waffle that brings together a delicious vanilla on vanilla treat suggested with white choc chips and fresh strawberry Topping. Brightly coloured rainbow Fruit Loops for texture and gooey Marshmallow pieces for soft centered loveliness encased in a Vanilla Velvet Marshmallow.